Spanning nearly five city blocks just steps from the city center, Los Angeles’ Little Tokyo is the largest of the nation’s three official Japanese American ethnic enclaves in America. The neighborhood has withstood over a century of shifting demographics and gentrification, even while it remains under assault by current redevelopment efforts including several proposed projects by the City of Los Angeles to expand public transit lines. Activists argue that these plans will displace local residents and destroy Little Tokyo’s traditional character. Despite persistent encroachment onto the neighborhood by surrounding developers, community organizers have worked to ensure that, at least so far, Little Tokyo remains the beating heart of the Southern California Japanese American community. It is this richly diverse Japanese American experience that is on display in “Home is Little Tokyo.” The mural is a visual testament to the vibrancy of Little Tokyo that continues to make it a political, cultural, and spiritual gathering place. One cannot help but see a parallel between the blemish of black-grey paint from this weekend’s vandalism and the gaping wound of the subway connector construction site that the mural faces: both feel like an assault upon Little Tokyo, itself. 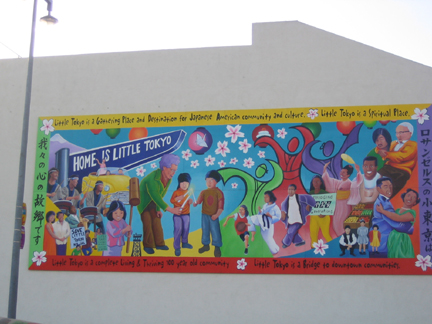 “Home is Little Tokyo” was the brainchild of Nancy Kikuchi, a longtime community organizer who served as the arts administrator for – as well as the driving force behind – the mural. Kikuchi passed away in 2014 of cancer at the age of 52 after dedicating a lifetime of service to enriching the Little Tokyo community. “Nancy epitomized what this community was all about,” says Takao Suzuki who worked on the mural with Kikuchi at the Little Tokyo Service Center (LTSC) – the group that managed the mural’s funding, creation, and installation on behalf of the Little Tokyo community. Suzuki is currently the Director of Community Economic Development at LTSC. “There isn’t anybody as committed to the community as Nancy was,” he says. Like Kikuchi, the mural holds a special place in the hearts of Little Tokyo community members. Reflecting the values of self-determination and teamwork that have long defined the over 100-year-old neighborhood of Little Tokyo, “Home is Little Tokyo” is a brightly-colored collection of symbols that weave together to form a rich tapestry reflecting the diversity of the Japanese American experience. Each element of the mural references a specific interpretation of Little Tokyo offered by its residents. Osumi, who curated the community’s ideas into the mural’s final design, remembers the many community meetings that he attended early in the mural’s planning stages. Osumi recounts how Issei immigrants wanted images of Mt. Fuji and cherry blossoms, while younger Sansei residents sought images to represent the community’s never-ending fight to preserve Little Tokyo from gentrification. “It’s terrible and heartbreaking,” says Osumi of the painful experience of learning that the mural had been defaced. “It’s mounted on a blank white wall that they could have spray-painted, but instead they climbed up there to specifically paint over the mural itself.” Osumi worries how he will tell the widow of artist Sergio Diaz about the vandalism. Diaz, who passed away late last year, included a portrait of his 18-month-old daughter in the lower corner of the mural that is now marred by the graffiti. Fukushima recounts how since Monday her social media has been filled with hurt and angry reactions from Southern California’s Japanese American community. Suzuki also confesses that his initial reaction to learning of the vandalism was anger, particularly given the significance of the mural and the work he put into its creation and maintenance. Now, however, he is focused on trying to figure out how to clean up the graffiti and restore the original artwork. Recently, the “Home is Little Tokyo” mural underwent restoration and updating by the Social and Public Art Resource Center (SPARC), a non-profit organization that helps to maintain Los Angeles public artworks. The Little Tokyo Service Center, which worked with SPARC to organize the mural’s restoration, had planned to unveil the updated mural later this year alongside the installation of a new engraved plaque to commemorate the life and legacy of Nancy Kikuchi. Now, however, Suzuki, Osumi, and Fukushima are hoping that as part of the restoration, the mural had received a protective coating that might facilitate removal of spray-painted graffiti. Little Tokyo Service Center has contacted Osumi, the City of Los Angeles, and SPARC, hoping that they can all help with the mural’s clean-up. Suzuki is also optimistic that the Little Tokyo community will come together to find funds to pay for the clean-up effort. 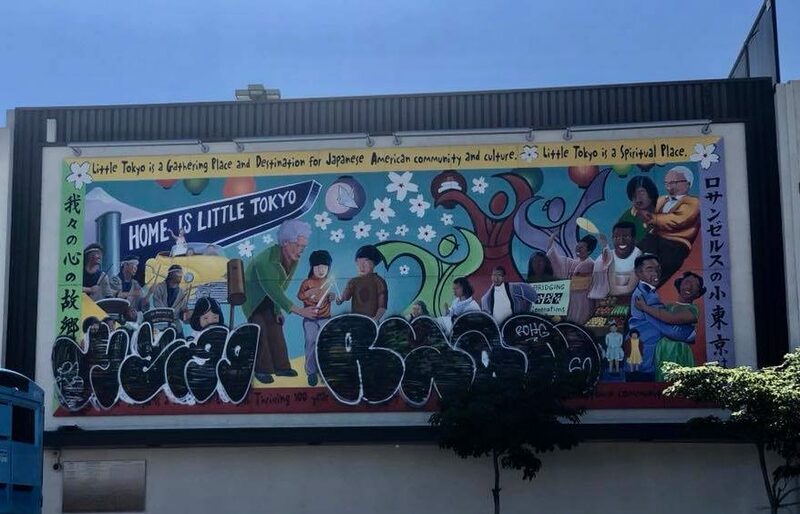 The identity of the person who spray-painted the Little Tokyo mural is still unknown, and a police investigation has been launched into the incident. Header image credit: Adina Mori-Holt, used with permission. My thanks to Sean Miura for helping guide my research for this article.